The Poker Show is live on the radio every week, no matter where you are. Simply tune the dial in your car, at work, or at home, and you'll be surrounded by the most recent news and issues in the world of poker. Radio not really your thing? 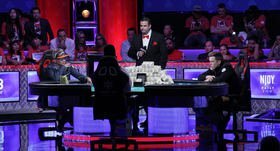 The popularity of television made it an easy choice for us to bring The Poker Show live to TV. You can also discover the world of poker, including rules of the game, etiquette, and tips, right from your living room. Your favourite card game is available for you to access at any time, anywhere. With so much going on with my favourite card game seemingly every day and not being able to be in front of the computer every day to watch the televised shows that Matchroom Sport puts out weekly, a live poker radio show was right up my alley. I could listen to The Poker Show on the go now that there's a great one, the UK's fist ever, made with help from Boylepoker.com. Sunday, Monday, and Tuesday, no matter where I am, I can tune in ThePokerShowLive.com directly or through a live streaming app in order to stay on top of the issues and news that come out in the huge sphere that poker has become. Though it took more than just content in order for this to be a success in my books, the addition of players being able to call the show as well as big names being invited as guests, and more importantly as regular hosts was the true draw for me. The so-called Voice of Poker himself, Jesse May, a man nearing fanatical devotion to the game as well as being a top notch TV commentator led the show, a welcome surprise, with his co-hosts Matt Broughton, a presenter of Sky Poker's The Club, and Ireland's own poker legend, Padraig Parkinson. While it was the premise and the names that drew me in, the chemistry and combined knowledge in this group was what kept me coming back for more. Perhaps May said it best when describing the program, "The Poker Show will be the soundtrack to your online poker evening. We want every poker rookie, junkie, sicko and nut to tune in, and we don't just want you to listen to us, we want to listen to you! This is no podcast; it's live and it's interactive, all call-in, all the time. 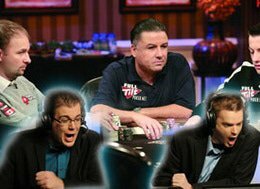 We'll be watching, gossiping and sweating everything that's going on in the poker world." Matchroom Sport didn't come out of nowhere with this great addition to my regular poker media consumption, they've been heavily involved since 2000 when the Poker Million started and recently brought out Poker Den: The Big Game and Premiere League Poker. Partnering with Boylepoker.com has allowed for great advertising as well as creating promotions and tournaments to run alongside the show. For a true poker fan, finding the show has proven to be a great opportunity to hear the opinions of legends in the industry and regular players like myself.